The scoreboard is a mechanism for assisting policy-making in international learning mobility. To access the scoreboard database, click the database tab. fiches presenting detailed country data and policy suggestions. 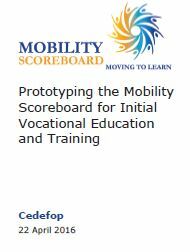 The mobility scoreboard for initial VET is produced within Cedefop’s department for VET systems and institutions (DSI). It is based on country information provided by ReferNet and validated by country representatives. The scoreboard was designed in cooperation with the European Commission (EMPL E3), EACEA/Eurydice, and the expert group on a mobility scoreboard for IVET. Cedefop has sole responsibility for the country information, data analysis, monitoring tools and policy suggestions presented. The analyses and policy suggestions are not intended to reflect the views of governments. Indicators of mobility in higher education and initial VET are available on the joint EACEA/Eurydice - Cedefop platform. Learn more on mobility in higher education in EACEA/Eurydice background report.